When you wish to make a bold statement that really shines, you have to pick bold accessories. 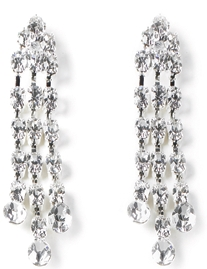 Triple drops of rhinestones dangle from a beautiful cluster of the sparkling stones. At the bottom of each strand is a slightly larger stone giving these that extra pizzazz. FWO Extra: These pierced earrings are 2 inches long.